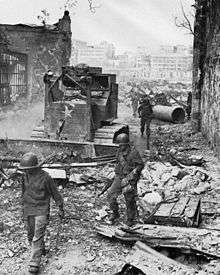 The Battle of Manila (February 3, 1945 – March 3, 1945) was a major battle of the Philippine campaign of 1944-45 during World War II that was fought by the American and Filipino forces against the Empire of Japan in Manila, the capital city of the Philippines. 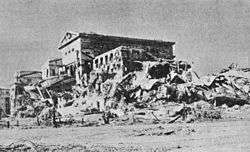 The one-month battle, which culminated in the massacre of over 100,000 civilians and complete devastation of the city, was the scene of the worst urban fighting in the Pacific theater. Along with the massive loss of lives, the battle also destroyed architectural and cultural heritage dating back since the city's foundation. 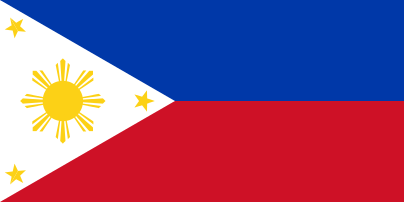 The battle ended the almost three years of Japanese military occupation in the Philippines (1942–1945). The city's capture was marked as General Douglas MacArthur's key to victory in the campaign of reconquest. 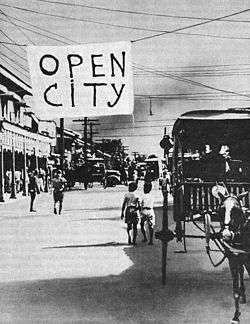 In 1941, General Douglas MacArthur had declared Manila an open city before its capture. 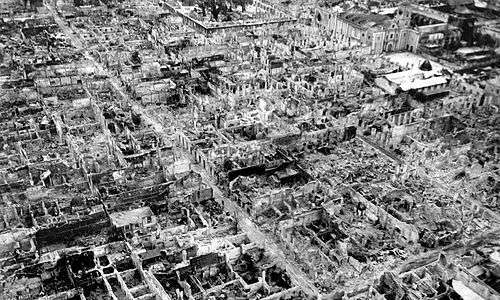 Although Yamashita had not done so in 1945, he had not intended to defend Manila; he did not think that he could feed the one million city residents:72 and defend a large area with vast tracts of flammable wooden buildings. 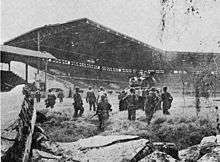 Gen. Yamashita had originally ordered the commander of Shimbu Group, Gen. Yokoyama Shizuo, to evacuate the city and destroy all bridges and other vital installations as soon as any large American forces made their appearance. 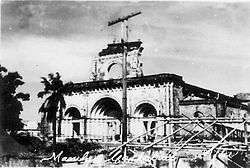 On 3 February, elements of the U.S. 1st Cavalry Division under Maj. Gen. Verne D. Mudge pushed into the northern outskirts of Manila and seized a vital bridge across the Tullahan River, which separated them from the city proper, and quickly captured Malacanang Palace. :91 A squadron of Brig. Gen. William C. Chase's 8th Cavalry, the first unit to arrive in the city, began a drive toward the sprawling campus of the University of Santo Tomas which had been turned into the Santo Tomas Internment Camp for civilians and the US Army and Navy nurses sometimes known as the "Angels of Bataan". Early on 6 February, General MacArthur announced "Manila had fallen". :97 But the battle for Manila had barely begun. 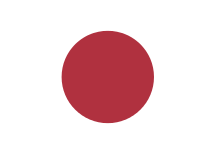 Almost at once the 1st Cavalry Division in the north and the 11th Airborne Division in the south reported stiffening Japanese resistance to further advances into the city. General Griswold continued to push elements of the XIV Corps south from Santo Tomas University toward the Pasig River. 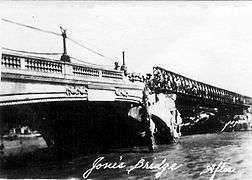 Late on the afternoon on 4 February, he ordered the 2nd Squadron, 5th Cavalry, to seize Quezon Bridge, the only crossing over the Pasig that the Japanese had not destroyed. 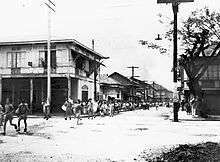 As the squadron approached the bridge, Japanese heavy machine guns opened fire from a formidable roadblock thrown up across Quezon Boulevard, forcing the cavalry to stop its advance and withdraw until nightfall. 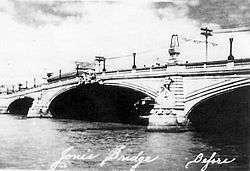 As the Americans and Filipinos pulled back, the Japanese blew up the bridge. In an attempt to protect the city and its civilians, MacArthur had placed stringent restrictions on U.S. artillery and air support. :103 Yet, by 9 February, American shelling had set fire to a number of districts. 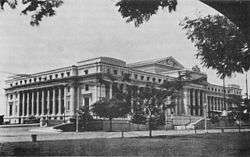 :114 "If the city were to be secured without the destruction of the 37th and the 1st Cavalry Divisions, no further effort could be made to save buildings, everything holding up progress would be pounded. ":122 Iwabuchi's sailors, marines and Army reinforcements, having initially successfully resisted American infantrymen armed with flamethrowers, grenades and bazookas, faced direct fire from tanks, tank destroyers, and howitzers, who attacked one building after another and killed the Japanese—and often the trapped civilians—inside, without differentiation. The fighting for Intramuros continued until 26 February. :171 Fewer than 3,000 civilians escaped the assault, mostly women and children who were released on 23 February afternoon. Colonel Noguchi's soldiers and sailors killed 1,000 men and women, while the other hostages died during the American shelling. "Griswold and Beightler were not willing to attempt the assault with infantry alone. Not expressly enjoined from employing artillery, they now planned a massive artillery preparation that would last from 17 to 23 February and would include indirect fire at ranges up to 8,000 yards as well as direct, point-blank fire from ranges as short as 250 yards. They would employ all available corps and division artillery, from 240mm howitzers down. (...) Just how civilian lives could be saved by this type of preparation, as opposed to aerial bombardment, is unknown. The net result would be the same: Intramuros would be practically razed." "That the artillery had almost razed the ancient Walled City could not be helped. To the XIV Corps and the 37th Division at this state of the battle for Manila, American lives were understandably far more valuable than historic landmarks. The destruction stemmed from the American decision to save lives in a battle against Japanese troops who had decided to sacrifice their lives as dearly as possible." For the rest of the month the Americans and Filipino guerrillas mopped up resistance throughout the city. 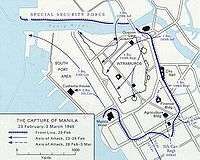 With Intramuros secured on 4 March, Manila was officially liberated, but large areas of the city had been levelled. The battle left 1,010 U.S. soldiers dead and 5,565 wounded. An estimated 100,000 to 500,000 Filipinos civilians were killed, both deliberately by the Japanese and from artillery and aerial bombardment by the U.S. military. 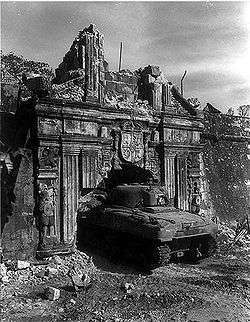 16,665 Japanese dead were counted within Intramuros alone. On February 18, 1995, the Shrine of Freedom also known as Memorare Manila Monument was erected. ↑ History of the 511th Airborne Regiment Archived 15 October 2007 at the Wayback Machine. ↑ Ephraim, Frank (2003). 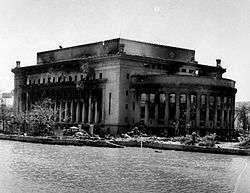 Escape to Manila: from Nazi tyranny to Japanese terror. University of Illinois Press. pp. 87. ISBN 978-0-252-02845-8. ↑ Echevarria de Gonzalez, Purita. Manila - A Memoir of Love and Loss, Hale & Iremonger, 2000. ISBN 0-86806-698-2. ↑ Russell Wilcox Ramsey; Russell Archibald Ramsey (February 1993). On Law and Country: The Biography and Speeches of Russell Archibald Ramsey. Branden Books. pp. 41. ISBN 978-0-8283-1970-6. ↑ Russell Wilcox Ramsey; Russell Archibald Ramsey (1993). On Law and Country: The Biography and Speeches of Russell Archibald Ramsey. 7. Branden Books. pp. 41. ISBN 978-0-8283-1970-6. ↑ "War Scars". Time Magazine. April 16, 1945. Retrieved 17 March 2016.